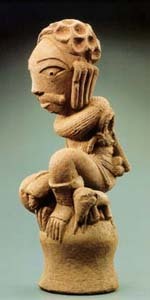 Archetype of Aesthetics : the invention of a canon in African art. 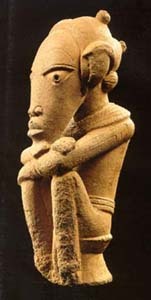 The terracotta statuary of the Nok Culture is a classic art style whose sudden appearance has radically challenged the traditional art history of African Sculpture. On the site of NOK, stone adzes were discovered ranging in age from Early Stone Age (37, 000 BC) until the first millenium. Therefore NOK figures belonged to a Neolithic Environment which gradually moved to Iron Work. Four main characteristics distinguish the NOK STYLE. 1. the treatment of the eyes, which form either a segment of a circle or sometimes a triangular form, with the eyebrow above balancing the sweep of the lower lip, sometimes making a circle. 2. the piercing of the pupils, the nostrils, the lips and the ears. 3. the careful representation of elaborate hairstyles, with complex constructions buns, tresses, locks and the profusion of beads around the neck, torso and waist. 4. the realism in the modeling of the curled lips, the straight nose with flaring nostrils and the large overhanging forehead. If the history of theories of proportions is the mirror of the history of styles, and if art is still a language, then let's name the NOK CANON the Archetype of the African Style by analogy to the generic African Bantu Language. Archetype de l'art bantou: l'invention du canon dans l'art Africain. Quatre characteristiques essentielles distinguent le NOK STYLE. 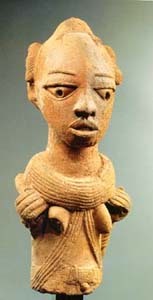 the archeological context: NOK Terracotta are to be considered as the archetypes of artistic creativity in Bantu Africa. 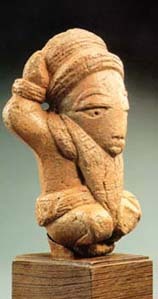 le contexte archeologique: NOK Terracotta a considere comme le reservoir des signes-meres de la creativite artistique dans l'Afrique Bantoue (35 000 ans d'age).